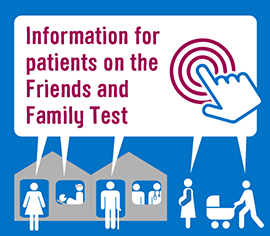 The Friends and Family Test (FFT) is an important feedback tool that supports the fundamental principle that people who use NHS services should have the opportunity to provide feedback on their experience. Listening to the views of patients and staff helps identify what is working well, what can be improved and how. The FFT asks people if they would recommend the services they have used and offers a range of responses. When combined with supplementary follow-up questions, the FFT provides a mechanism to highlight both good and poor patient experience. This kind of feedback is vital in transforming NHS services and supporting patient choice. During 2018/19, we are carrying out a development project to improve the FFT and make it a more useful tool for driving service improvement and we are committed to producing refreshed guidance by April 2019, in line with a government Mandate. So far, the FFT has produced around 55 million pieces of feedback so far – and the total rises by around 1.2 million more every month – making it the biggest source of patient opinion in the world. Scores so far have told us that at least nine out of ten patients would recommend the NHS services they used to their loved ones. Patient comments also identify areas where improvements can be made so that providers can make care and treatment better for everyone. See our section on Implementing FFT Guidance for details of how the FFT works. While the results will not be statistically comparable against other organisations because of the various data collection methods, FFT provides a broad measure of patient experience that can be used alongside other data to inform service improvement and patient choice. The latest data is published every month. The results of the FFT are published at monthly intervals on both the NHS England and NHS websites. Since April 2014, all NHS trusts providing acute, community, ambulance and mental health services in England have also been required to implement the FFT for staff. Guidance to support organisations administering the Staff FFT is published on the Staff Friends and Family Test page.